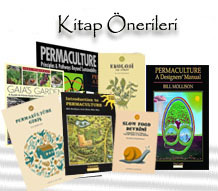 Permakültürle ilgili sıkça sorulan sorular – hira d.
A Designers’ Manual – Bill Mollison; Tagari Pub., 1988. Permaculture: Principles and Pathways Beyond Sustainability – David Holgrem; Holgrem Design services. The Earth Care Manual – Patrick Whitefield; Permanent Publications, 2004. Earth User’s Guide to Permaculture, Rosemary Morrow; Simon & Schuster, 2000. Ekin Sapı Devrimi; Masanobu Fukuoka, Kaos Yay., 2006. Smart Permaculture Design, Jenny Allen; New Holland Pub, 2007. Ekoloji – Ernest Callenbach; SinekSekiz, 2010. Getting Started in Permaculture, R. Mars, j. Mars; Permanent Pub., 2007. Permaculture: A Beginners Guide, G. Burnett; 2008.